1 mayor | This Blog Rules | Why go elsewhere? 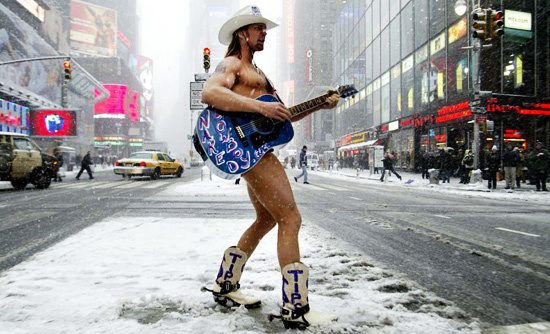 The famous “Naked Cowboy”, Robert Burck, from New York that entertains tourists in his underwear, wants to run for mayor.”No one knows how to do more with less than yours truly” is his kind of thinking that he wants to share with the New York citizens if they elect him. He earns about 1000 dollars a day busking in nothing more than his boots, cowboy hat and white underpants. The cowboy is willing to run against Mayor Michael Bloomberg, a billionaire and Wall Street whiz.